New Delhi — The Indian Space Research Organization (ISRO) is working on a next-generation launch vehicle that would have the capacity of carrying payloads four times higher than the capacity of its operational launch vehicles. The Indian government confirmed the development on Wednesday. "India has a Launch Vehicle system with a capability to put 4 — ton class of satellites to GTO, whereby meeting all the national requirements. While other countries have higher launch capabilities, ISRO is making its own plans to increase its launch vehicle capabilities, even up to 16 tons to GTO in the future," Jitendra Singh, India's Minister of State for Space told Parliament. Presently, India has three launch vehicles, namely, polar satellite launch vehicle (PSLV) with a launch capability of 1.75 tons to 600 km sun-synchronous polar orbit, geosynchronous satellite launch vehicle (GSLV) with a launch capability of 2.2 tons to geosynchronous transfer orbit (GTO) and geosynchronous satellite launch vehicle — Mark III with a launch capability of 4 tons to the geosynchronous transfer orbit (GTO). "ISRO is presently working on a reusable launch vehicle, cryogenic and semi-cryogenic engine. It has already made success in cryogenic and reusable launch vehicle technology. ISRO has already started work on technology development of super heavy lift vehicle. So, it is feasible but how much time it will take cannot be predicted as of now," Ajey Lele, a senior fellow at Delhi based Institute of Defense Studies and Analyses told Sputnik. Now, the Indian government intends to initiate development activities for a semi-cryogenic stage and the clustering of semi-cryogenic engines in order to upgrade the launch capability. 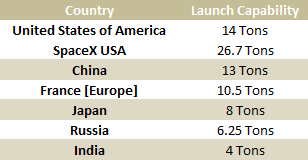 The maximum launch capabilities to GTO of other space agencies are — USA: 14 tons, China: 13 tons, Europe: 10.5 tons, Russia: 6.25 tons, and Japan: 8 tons. Recently, US private firm SpaceX has demonstrated the launch of a heavy lift launch vehicle, Falcon Heavy, which can carry 26.7 tons to GTO. It was after the launch of Falcon Heavy that ISRO Chairman K. Sivan had said in February of this year that a heavy lift vehicle of the future was on the drawing board as part of the organization's R&D. "We are doing a lot of preliminary research leading to it. Right now, we are developing a semi-cryogenic engine, which was approved some time back. Next, we must propose [for funding approval] a full semi-cryogenic stage. A lot of work is ahead of us, in this," Dr. Sivan had said.